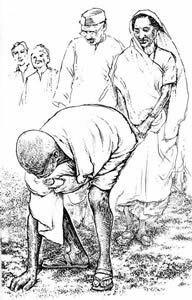 Selections from Gandhiji's writings and speeches to explain his view on Swadeshi/Khadi. After much thinking I have arrived at a definition of Swadeshi that, perhaps, best illustrates my meaning. Swadeshi is that spirit in us which restricts us to the use and service of our immediate surroundings to the exclusion of the more remote. Thus, as for religion, in order to satisfy the requirements of the definition, I must restrict myself to my ancestral religion. That is the use of my immediate religious surrounding. If I find it defective, I should serve it by purging it of its defects. In the domain of politics, I should make use of the indigenous institutions and serve them by curing them of their proved defects. In that of economics, I should use only things that are produced by my immediate neighbours and serve those industries by making them efficient and complete where they might be found wanting. It is suggested that such Swadeshi, if reduced to practice, will lead to the millennium, because we do not expect quite to reach it within our times, so may we not abandon Swadeshi even though it may not be fully attained for generations to come. Let us briefly examine the three branches of Swadeshi as sketched above. Hinduism has become a conservative religion and, therefore, a mighty force because of the Swadeshi spirit underlying it. It is the most tolerant because it is non-proselytizing, and it is as capable of expansion today as it has been found to be in the past. It has succeeded not in driving out, as I think it has been erroneously held, but in absorbing Buddhism. By reason of the Swadeshi spirit, a Hindu refuses to change his religion not necessarily because he considers it to be the best, but because he knows that he can complement it by introducing reforms. And what I have said about Hinduism is, I suppose, true of the other great faiths of the world, only it is held that it is specially so in the case of Hinduism. Following out the Swadeshi spirit, I observe the indigenous institutions and the village Panchayats hold me. India is really a republican country, and it is because it is that, that it has survived every shock hitherto delivered. Princes and potentates, whether they were Indian born or foreigners, have hardly touched the vast masses, except for collecting revenue. The latter, in their turn, seem to have rendered unto Caesar what was Caesar's and for the rest have done much as they have liked. The vast organization of caste answered not only the religious wants of the community, but it answered to its political needs. The villagers managed their internal affairs through the caste system, and through it they dealt with any oppression from the ruling power or powers. It is not possible to deny of a nation that was capable of producing from the caste system its wonderful power of organization. One had but to attend the great Kumbh Mela at Hardwar last year to know how skilful that organization must have been which, without any seeming effort, was able effectively to cater for more than a billion pilgrims. Yet, it is the fashion to say that we lack organizing ability. This is true, I fear, to a certain extent, of those who have been nurtured in the new traditions. We have laboured under a terrible handicap owing to an almost fatal departure from the Swadeshi spirit. We, the educated classes, have received our education through a foreign tongue. We have, therefore, not reacted upon the masses. We want to represent the masses, but we fail. They recognize us not much more than they recognize the English officers. Their hearts are an open book to neither. Their aspirations are not ours. Hence, there is a break. And you witness not in reality failure to organize but want of correspondence between the representative and the represented. If, during the last fifty years, we had been educated through the vernaculars, our elders and our servants and our neighbours would have partaken of our knowledge; the discoveries of a Bose or a Ray would have been household treasures, as are the Ramayana and the Mahabharata. As it is, so far as the masses are concerned, those great discoveries might as well have been made by foreigners. Had instruction in all the branches of learning been given through the vernaculars, I make bold to say that they would have been enriched wonderfully. The question of village sanitation, etc., would have been solved long ago. The village Panchayats would be now a living force in a special way, and India would almost be enjoying self-government suited to its requirements. And, now for the last division of Swadeshi. Much of the deep poverty of the masses is due to the ruinous departure from Swadeshi in the economic and industrial life. If not an article of commerce had been brought from outside India, she would be today a land flowing with milk and honey!1 But that was not to be. We were greedy, and so was England. The connection between England and India was based clearly upon an error. But she does not remain in India in error. It is her declared policy that India is to be sheld in trust for her people. If this is true, Lancashire must stand aside. And if the Swadeshi doctrine is a sound doctrine, Lancashire can stand aside without hurt, though it may sustain a shock for the time being. I think of Swadeshi not as a boycott movement undertaken by way of revenge. I conceive it as a religious principle to be followed by all. I am no economist, but I have read some treatises which show that England could easily become a self-sustained country, growing all the produce she needs. This may be an utterly ridiculous proposition, and perhaps the best proof that it cannot be true, is that England is one of the largest importers in the world. But India cannot live for Lancashire or any other country before she is able to live for herself. And she can live for herself only if she produces and is helped to produce everything for her requirements within her own borders. She need not be, she ought not to be, drawn into the vortex of mad and ruinous competition which breeds fratricide, jealousy and many other evils. But who is to stop her great millionaires from entering into the world competition? Certainly, not legislation. Force of public opinion, proper education, however, can do a great deal in the desired direction. The hand-loom industry is in a dying condition. I took special care, during my wanderings last year, to see as many weavers as possible, and my heart ached to find how they had lost, how families had retired from this once flourishing and honourable occupation. 1. "Had we not abandoned Swadeshi, we need not have been in the present fallen state. If we would get rid of the economic slavery, we must manufacture our own cloth and, at the present moment, only by hand-spinning and hand-weaving." - Mahatma: Vol. II, p.21. If we follow the Swadeshi doctrine, it would be your duty and mine to find out neighbours who can supply our wants and to teach them to supply them where they do not know how to proceed, assuming that there are neighbours who are in want of healthy occupation. Then every village of India will almost be a self-supporting and self-contained unit, exchanging only such necessary commodities with other villages where they are not locally producible. This may all sound nonsensical. Well, India is a country of nonsense. It is nonsensical to parch one's throat with thirst when a kindly Mohammedan is ready to offer pure water to drink. And yet thousands of Hindus would rather die of thirst than drink water from a Mohammedan household. These nonsensical men can also, once they are convinced that their religion demands that should wear garments manufactured in India only and eat food only grown in India, decline to wear any other clothing or eat any other food. Lord Curzon set the fashion for tea-drinking. And that pernicious drug now bids fair to overwhelm the nation. It has already undermined the digestive apparatus of hundreds of thousands of men and women and constitutes as additional tax upon their slender purses. Lord Hardinge can set the fashion for Swadeshi, and almost the whole of India will forswear foreign goods. There is a verse in the Bhagvad Gita which, freely rendered, means masses follow the classes. It is easy to undo the evil if the thinking portion of the community were to take the Swadeshi vow, even though it may for a time cause considerable inconvenience. I hate legislative interference in any department of life. At best, it is the lesser evil. But I would tolerate, welcome, indeed plead for a stiff protective duty upon foreign goods. Natal, a British colony, protected its sugar by taxing the sugar that came from another British colony, Mauritius. England has sinned against India by forcing free trade upon her. It may have been food for her, but it has been poison for this country.1 1. "We are too much obsessed by the glamour of the West. We forget that what may be perfectly good for certain conditions in the West is not necessarily good for certain other, and often diametrically opposite, conditions in the East. Free trade, which may have been good enough for England, would certainly have ruined Germany. Germany prospered only because her thinkers, instead of slavishly following, England took note of the special conditions of their own land, and devised economics suited to them." It has often been urged that India cannot adopt Swadeshi in the economic life at any rate. Those who advance this objection do not look upon Swadeshi as a rule of life. With them it is a mere patriotic effort not to be made if if involved any self-denial. Swadeshi, as defined here, is a religious discipline to be undergone in utter disregard of the physical discomfort it may cause to individuals. Under its spell, the deprivation of a pin or a needle, because these are not manufactured in India, need cause no terror. A Swadeshist will learn to do without hundreds of things which today he considers necessary. Moreover, those who dismiss Swadeshi from their minds by arguing the impossible, forget that Swadeshi, after all, is a goal to be reached by steady effort. And we would be making for the goal even if we confined Swadeshi to a given set of articles, allowing ourselves as a temporary measure to use such things as might not be procurable in the country. There now remains for me to consider one more objection that has been raised against Swadeshi. The objectors consider it to be a most selfish doctrine without any warrant in the civilized code of morality. With them to practise Swadeshi is to revert to barbarism. I cannot enter into a detailed analysis of the proposition. But I would urge that Swadeshi is the only doctrine consistent with the law of humility and love. It is arrogance to think of launching out to serve the whole of India when I am hardly able to serve even my own family. It were better to concentrate my effort upon the family and consider that through them I was serving the whole nation and, if you will, the whole of humanity. This is humility and it is love. The motive will determine the quality of the act. I may serve my family regardless of the sufferings I may cause to others. As, for instance, I may accept an employment which enables me to extort money from people. I enrich myself thereby and then satisfy many unlawful demands of the family. Here I am neither serving the family nor the State. Or, I may recognize that God has given me hands and feet only to work with for my sustenance and for that of those who may be dependent upon me. I would then at once simplify my life and that of those whom I can directly reach. In this instance, I would have served the family without causing injury to anyone else. Supposing that everyone followed this mode of life, we should have at once an ideal state. All will not reach that state at the same time. But those of us who, realizing its truth, enforce it in practice, will clearly anticipate and accelerate the coming of that happy day. Under this plan of life, in seeming to serve India to the exclusion of every other country, I do not harm any other country. My patriotism is both exclusive and inclusive!1 It is exclusive in the sense that in all humility I confine my attention to the land of my birth, but it is inclusive in the sense that my service is not of a competitive or antagonistic nature. Sic utere tuo ut alienum non laedas is not merely a legal maxim, but it is a grand doctrine of life.2 It is the key to a proper practice of Ahimsa or love. It is for you, the custodians of a great faith, to set the fashion and show by your preaching, sanctified by practice, that patriotism based on hatred "killeth" and that patriotism based on love "giveth life". From an address at the Missionary Conference, Madras, on Feb.14, 1916. "My patriotism is not an exclusive thing. It is all embracing and I should reject that patriotism which sought to mount upon the distress or exploitation of other nationalities. The conception of my patriotism is nothing if it is not always, in every case without exception, consistent with the broadest good of humanity at large." "My nationalism, fierce though it is, is not exclusive, is not devised to harm any nation or individual. Legal maxims are not so legal as they are moral. I believe in the external truth of 'sic utere tuo ut alienum non laedas'. (Use thy own property so as not to injure thy neighbour's)." - Young India: March 26, 1931.